Because we put our residents first, everything else falls into place. Ultimately, thatâ&#x20AC;&#x2122;s what makes the Ryman difference. Come and experience the Ryman difference When Ryman Healthcare was founded more than 30 years ago, our co-founder Kevin Hickman set one simple standard: it’s got to be good enough for Mum – or Dad. In my case, it had to be good enough for Nana. She lived in a Ryman village and loved it, and that was my ﬁrst introduction to the company. When people ask me what I do, I’m always proud to tell them I work for Ryman. I regard looking after people as a great privilege, especially our older generations to whom we owe so much. There’s always plenty going on in Ryman’s warm and vibrant communities. Because we get our resident experience right and look after our staﬀ, everything else falls into place. Ultimately, that’s what makes the Ryman diﬀerence. We design our villages for you now and into your future. If your health needs change, we have a range of care options to support you, all within the one village community. Our resident-friendly terms are held up as a leading example by lawyers acting for our residents. There are no hidden costs, such as refurbishment fees, and our agreements are written in plain language so they’re easy to understand. We appreciate that the decisions ahead are important ones in your later years. We thank you for considering us and we will do our best to help you make the choice that is right for you. If there is anything you are worried about, or any questions you have after reading this booklet, please ask our team. Or even better, come and visit for a cup of tea, or lunch, and chat with our residents and staﬀ. 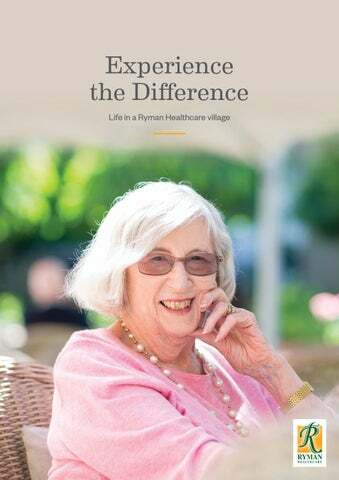 We hope this booklet will give you a glimpse into the lifestyle that a Ryman village can oﬀer you. And if you do choose to make a Ryman village your home, welcome. We know you’ll love it there. At a Ryman village we work to make a positive diﬀerence in the daily lives of our residents. We think the world of our staﬀ, and our residents do too. No hidden costs. At Ryman, ‘no hidden costs’ means no waitlist fees, no surprise costs when you move in, and no administration fees. There are also no refurbishment, marketing or on-sale costs when you leave, as these are covered by the deferred management fee that Ryman caps at 20 percent – one of the lowest in the retirement sector. Our terms and conditions are transparent and easy for everyone to understand. They’re kind, empathetic and dedicated to our residents. The success of our villages comes down to the commitment and caring professionalism of our staﬀ. By constantly innovating and evolving, we are also empowering staﬀ to improve the resident experience. The myRyman care program demonstrates this perfectly, where innovative technology creates more quality time between carers and residents. Fixed weekly fee. Our ﬁxed weekly fee provides certainty about your living costs. Our weekly fee for independent and assisted living is ﬁxed for life*, and there are no hidden costs. Ultimately, happy staﬀ make happy residents. That’s the experience we live every day at Ryman. We’re dedicated to caring for you now and into your future. With input from our residents, we developed seasonal menus with delicious recipes made by Ryman in-house chefs. Your health needs may change over time. It's reassuring to know you can remain living in the same village community, in close contact with your spouse or friends at the village. myRyman Care. In every resident’s care room, a tablet with our custom-built electronic care program enables nurses and carers to see and record everything they need to know about each resident. This innovation has dramatically reduced paperwork and created more quality time between carers and residents. Once you live in a Ryman village, you'll have priority access to care options that suit your needs. Ryman villages oﬀer independent living and assisted living in a serviced apartment. We also provide low care, high care, and specialist dementia care. Emergency generators. We have emergency generators at every village, which includes our serviced apartments, care centres and village centres. We’re not required to do this, but we see it as a prime example of putting our residents ﬁrst. So, if a power outage occurs, our generators will kick in to keep both our residents and staﬀ safe and comfortable. Finding the perfect business Kevin and his business partner, accountant John Ryder, had met a few years earlier. Kevin had left the police to set up his own private investigation business and needed an accountant. Kevin says the partnership worked because they had complementary skills. The pair were on the look-out for a business opportunity. After Kevin’s experience with the ﬁre-damaged resthome, they knew they’d found what they were looking for. They could start a business that would improve the way older people lived and how they were cared for. It was a business they could feel good about and believe in completely. They soon found a block of 14 two-bedroom ﬂats in Christchurch, New Zealand, which they would convert into their ﬁrst resthome. Kevin calls the current leaders ‘the Ryman kids’ – and ‘kids’ pretty much describes what they were when they started. Chief Sales and Marketing Oﬃcer Debbie McClure started out as a village administrator in 1990. Chief Operations Oﬃcer Barbara Reynen-Rose was a young nurse manager when she was hired in 1992. Both Kevin and John believed in bringing young, talented people through the ranks to top roles. People had to have the Ryman way of working in their DNA to become Rymanians. They had to have care at the heart of everything they did. The resthome was renamed Riverside and was a great success. Ryman was soon in the market for a second property. A motel complex in Christchurch became their next development. “Because we didn’t have much money, I lived there while we rebuilt it,” Kevin says. Kevin and John believed in reinvesting to grow the company. Proﬁts were reinvested to lay the foundations for future earnings so that the value of the investment was always compounding. It was a business they could feel good about and believe in completely. The Ryman recipe was to buy the right site in a well-established suburb, use working capital to build the ﬁrst stage of the village, sell that, and use the capital to fund the next stage. They’d then build a care wing and operate the village using home-grown staﬀ trained in Ryman systems. There’s so much that goes on in a Ryman village. We’re part of vibrant communities. Our residents are involved in art exhibitions, fashion shows, music and dance performances, and a huge mix of outings. Residents love the village environment and they feel connected to their neighbours and friends – whether they love the social life or enjoy a little quiet time. Some villages have cafés or you can pop down to the village lounges, have a cup of tea, and catch up with people. It’s all right there. The beauty of village life is that you can take it or leave it. If some days you want to shut your door to have some quiet time, you can. It’s a very social life for those who choose to mix and mingle. There are opportunities for the quiet life, too, if that’s what people prefer. We create outdoor living areas with beautifully landscaped gardens, lush green grass and leafy shrubs around all our villages. If you don’t feel like cooking, our seasonal Delicious menus are on oﬀer in the dining room. Simply make a reservation at the village reception. Independent living: the best of both worlds Independent living combines the best of both worlds – the freedom to come and go as you please, with the security and companionship of the village community. Or you might like to come to one of our monthly ﬁne-dining evenings, and enjoy a special dinner with friends or family. Many of our apartments have balconies with lovely views, or patios with garden access. Every site has diﬀerent attributes, and so we design diﬀerent villages to suit the sites. These events are always popular, so you need to book early to secure a Delicious evening out. Independent living combines the best of both worlds – the freedom to come and go as you please, with the security and companionship of the village community. Our apartments are designed speciﬁcally with the 65-plus person in mind. Spacious and well thought out, they include call-assist alarms that are monitored 24 hours a day by our on-site staﬀ. You can retain a high level of independence while living in the village, and without the worry of maintenance (exterior maintenance, lawn mowing, and window cleaning are all included), and you'll have more time and energy to enjoy what you really love. Serviced apartments: independence with a little extra help Serviced apartments are located in the heart of the village, with easy access to lounges, dining, and other amenities. In fact, one in ﬁve Ryman residents lives in a serviced apartment. And it’s easy to see why – you still have the independence of your own home, just with a little extra help. As well as help with daily living, such as housekeeping, you’ll enjoy a Delicious homecooked main meal in the dining room, and morning and afternoon tea. More services are available, like having breakfast delivered to your room – it's your choice. The apartment is your home, and you can make it your own with your favourite furniture and by decorating it to your taste. You’ll have a kitchenette with a fridge and microwave, a separate bedroom (some of our villages oﬀer studio apartments), and a private ensuite. Balcony or patio options allow you space for your pot plants. Many residents say that serviced apartment living has taken the stress away and given them renewed conﬁdence. And, as with the independent apartments, the call-assist alarms mean help is always available at the touch of a button. We oﬀer tailored packages in serviced apartments, and work alongside each resident to help them ﬁnd the living option that will suit them best. That’s the beauty of serviced apartments – we can customise your preferences or needs, right down to the smallest detail. Many residents say that serviced apartment living takes away the stress and gives them renewed confidence. Our offer is affordable and transparent Security for our residents is about more than looking after their physical safety. As we see it, security also includes having ďŹ nancial certainty. At Ryman when you buy an independent or serviced apartment, you know exactly how much youâ&#x20AC;&#x2122;re paying and what youâ&#x20AC;&#x2122;re going to get back at the end of your occupancy. Our agreement is written in plain language and is easy for everyone to understand. Many retirement living agreements are dense and hard to decipher, causing confusion and unexpected costs when it comes time to leave. Ryman oﬀers some of the most residentfriendly terms in Australasia. The weekly fee for apartments is ﬁxed for life*, and the deferred management fee, which Ryman caps at 20 percent, is one of the lowest in the retirement sector. Most of our residents live relatively close to our villages prior to moving in. Based on the local property market, our village living is aﬀordable for people in the local area who want to stay in their own community. When someone decides to move into one of our villages, they sell their house – often the family home. In many circumstances a portion of that money buys their residence rights in the village, and they will have money left over to give them ﬁnancial certainty. Our Peace of Mind Guarantees make sure our terms are clear and transparent. We’ve developed nine Peace of Mind Guarantees to protect residents and their families. The deferred management fee is your contribution to the refurbishment and management of the village. It is charged on an ‘enjoy now, pay later’ basis, and is deducted when your capital sum is repaid to you. If you wish to transfer to a serviced apartment, or to another Ryman village, your deferred management fee will be no more than 20% overall. You and your family will have certainty about the amount you are paid when you leave the village. You will not be exposed to any capital loss when the apartment is on-sold. Buying your new home in a retirement village is an important decision. We want you to be conﬁdent you’ve made the right choice in selecting a Ryman village. • rates, water rates, and building insurance • gardening, ground maintenance, and rubbish collection • maintenance and operation of the community facilities • exterior maintenance of your apartment, including inside and outside window cleaning • our activities program, including art exhibitions, fashion shows, music and dance performances, arts and crafts and puzzles • social time at our weekly complimentary Happy Hours • our optional Never Alone electronic alarm system that triggers if no movement is detected for 24 hours • our call-assist alarm is monitored 24 hours a day by on-site staﬀ • village management and administration. Residents in serviced apartments also receive: • a main meal – three choices, including a vegetarian option, each day • morning and afternoon tea • housekeeping • electricity and heating. Residents in serviced apartments can defer payment of any additional charges over and above the base weekly fee in certain ﬁnancial situations (with Ryman's agreement). Additional interest may apply. We understand that your living requirements may change over time, and it is common for residents in our villages to move during their time with us. As part of our 'care options to suit your needs' guarantee, you will have priority right to transfer to the care centre within the village if the need arises. Or, if necessary, you could transfer to a care centre within another Ryman village. We want you to be living where your needs can best be met. If it’s no longer appropriate for you to remain in your unit, we may ask that you transfer to a more suitable part of the village. We will only make this request after careful consultation with you, your family members and advisors, and with advice from a medical practitioner. We’ll also make every eﬀort to cater to your needs in your unit, to avoid you having to move. It’s a relief to know that you are guaranteed priority access to low care, high care, and dementia care facilities. *Some conditions and exceptions apply. We want our resident experience to be just right Remember when neighbours had time to stop for a chat, cared about each other, and waved a friendly hello in passing? At Ryman, we create the kind of community environment that residents grew up in. Our villages have an atmosphere of companionship and community spirit, where neighbours look out for one another. We’re investing more than ever in the resident experience. We're adding cafés to our villages to create a place for residents to relax and catch up with one another and with visiting friends and family. Ryman’s village amenities can include a hair and beauty salon, shop, cinema, bowling green, and heated indoor swimming pool. Our villages all have beautifully landscaped gardens where you can enjoy peaceful strolls or let the grandchildren play. We create the kind of community environment that residents grew up in. We want to make our resident experience just right – from special events and outings, to our specially designed Triple A exercise program and our Delicious meals made fresh on-site by our village chefs. We want our residents to enjoy living with us! Our residents are connected to vibrant communities Residents can join in the many activities on oﬀer. It may be going on a group bus trip, heading oﬀ to visit an exhibition or joining one of the many interest groups. If you happen to pop into the village centre during morning and afternoon tea time, there's often fresh baking or something sweet to enjoy. It's a great opportunity to catch up with friends over a cup of tea. We bring life into the villages so that people who can’t get out and about as much can still experience a lot of life and a lot of fun. Our residents can see art exhibitions, fashion shows, music and dance performances, and enjoy a colourful mix of visitors. Young parents’ groups bring children into the villages, and our residents go out into schools and help children with their reading. It’s not unusual to ﬁnd farm animals in our villages: we’ve had visits from horses, lambs, rabbits, dogs, and chickens. There’s always plenty going on Ryman has partnered with the Melba Opera Trust, Australia’s premier scholarship program for young opera singers. The Trust’s aim is to foster the next generation of talented stars. We also sponsor the Melbourne Symphony Orchestra, and residents can attend events with the orchestra. Residents can enjoy regular trips together – picnics in the park, days at the beach, and trips to restaurants and wineries. Ryman Engage – our complimentary activities program – is about embracing opportunities and activities that are thoughtfully planned, age and ability appropriate, and make the most of our beautiful facilities. A ﬁrm favourite among the residents is the complimentary Happy Hour. Designed for older people, the Ryman Triple A (Ageless, Active and Aware) complimentary exercise program encourages residents to keep moving. Catering for all ability levels, many residents are surprised to ﬁnd that they are more active since they moved into the village. Residents tell us that taking part in the program improves their strength, balance and mobility. This also helps to prevent falls and to maintain independence. The key is to provide something for everyone. From the Men’s Shed to arts and crafts, and puzzles for intellectual stimulation, we’ll satisfy whatever it is that sparks your interest. And there are always outings in the village van. Regular entertainers perform for residents, and relatives often come along to join in the fun. for 4 weeks – unless of course it’s back by popular demand! Meals are a big part of a resident’s day and so the food has to be great. Mealtimes provide an event to look forward to and an opportunity to connect with others. We’ve made the main meal the centrepiece of the day, and of course your relatives and friends are welcome to join you for a meal at any time. Our Delicious menus provide good oldfashioned home-cooked meals, as well as some exotic creations, all made by our in-house village chefs. Care options to suit your needs Your health needs may change over time and if they do, it’s good to know you won’t have to move again. We’re dedicated to caring for you now and into your future. 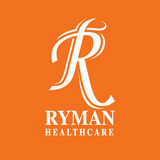 Once you live in a Ryman village, you will have priority access to care options that suit your needs. * It's particularly comforting for couples who are at different stages in their health to know that they can be cared for within the same village. Low care Low care residents receive the very best in clinical care, alongside the beneﬁts of living in our friendly community. The care we provide is speciﬁc to your needs, and private rooms are spacious with a selection of room layouts to choose from. As well as independent living and assisted living in serviced apartments, Ryman villages oﬀer low care, high care, and specialist dementia care. Ryman care centres also welcome residents who need respite care. The care we provide is individualised to suit your needs. Our electronic care program, myRyman Care, provides detailed information about your needs and preferences – and it’s right there, in your care room. High care High care rooms are similar to low care, and provide for those who have signiﬁcant medical needs. Care is provided by trained caregivers and registered nurses and is overseen by unit coordinators and a clinical manager. A registered nurse is always on duty, and our on-call doctor service is always available. Wherever possible, the same staﬀ members will care for you each day. The care we provide is individualised to suit your needs. *Room availability can vary between villages. Please check with your local village. Our purpose-built dementia care units provide a secure haven in a warm and home-like environment for people with dementia. If you live independently but need assistance for a short period of time, you can receive respite care that suits your needs. And we can provide that care for as long as you need – whether it’s for a single night or a few weeks. We like to go the extra mile Weâ&#x20AC;&#x2122;re always looking at ways to improve our resident experience. We invest in innovation that directly beneďŹ ts the daily lives of our residents. We listen to what our residents tell us. We ask a lot of questions and we take a lot of notice of what our residents and their families tell us. We’ve done that for a long time now. The myRyman Care revolution Our own custom-built electronic care program, myRyman, gives nurses and caregivers all the personalised care information they need, at the bedside, to provide the best care for every resident. Our regular surveys give residents and their families an opportunity to tell us how they’re feeling in the village, what the food is like, how the laundry service works, and how the staﬀ are communicating with them. Located in every care resident’s room, myRyman tablets enable nurses and caregivers to see everything they need to know about each resident. This technology has dramatically reduced paperwork and created more quality time between carers and residents. Good communication sets us apart. Our monthly Village Connection newsletters keep families up to date with what’s happening in the village. We also provide an activities calendar to residents each month outlining the entertainment and activities scheduled each day of the month. Our myRyman program also engages residents and their families in the care plan. Our staﬀ can sit down with them in the resident’s room and talk together about the information on screen. It’s another way we can provide exceptional care. It’s about the difference we can make to the daily lives of our residents. We're serious about making progress on reducing our energy consumption and landfill waste. Sustainability We know that caring for the environment is important to our residents and our staﬀ. They want to make sure we’re doing our absolute best for the generations to come. Our staﬀ are trained in emergency procedures, and emergency drills are held every 6 months. We have speciﬁc procedures in place to guide us through a disaster or emergency. In 2018 we became a Certiﬁed Emissions Measurement and Reduction Scheme (CEMARS) company. We’ve measured our carbon footprint and developed an emissions management and reduction plan. All facilities and private care rooms are ﬁtted with smoke detectors and sprinklers that are operated by an alarm and monitored by staﬀ. We have installed emergency power generators at every village centre. We recognise that when a power outage occurs, this can be a frightening and stressful experience for residents. That’s why we want to guarantee that residents and staﬀ will be safe and comfortable even if the lights go out. The generators ensure all essential services continue to function. As a CEMARS-certiﬁed company, we’re audited each year on our carbon-emissions performance so that we can measure our progress against our reduction targets. We’re serious about making progress, and committing to the CEMARS program shows that we mean business. We’ve come up with a range of measures to cut back on our impact, including reducing our energy consumption and landﬁll waste. Visitors Q. Can I have people to stay in my unit? A. Yes, for short periods of time. As a courtesy, we ask that you consult with the village manager ﬁrst. Q. Are there visitor hours for residents in the care centres? A. There are no set visiting hours. This is your home, so visitors are welcome any time. The facilities are available for you to enjoy with your friends and family. We just ask that you respect the privacy of other residents. General living Q. What is the entry-level age to live in a Ryman village? A. Our villages are designed for residents aged 65 and over. Q. How much does it cost for the Occupation Rights to a unit? A. Yes, there is no need for you to give up your car. Apartments have basement parking available to buy. A. Prices vary throughout each village, so we recommend asking for the prices relating to units currently available. The residence contract gives the resident a lease for up to 49 years and access to community facilities. Q. Can I have a pet in the village? A. Yes, as long as the village manager approves your pet as being suitable for the village. Q. Is there a way I can attend church services? Q. What does the deferred management fee cover? A. Yes, we have weekly inter-denominational church services at our villages. A. The deferred management fee, which is capped at 20 percent of your interest-free occupancy loan, operates on an ‘enjoy now, pay later’ basis. It covers the costs of refurbishing and reselling the unit (at the end of the tenancy), and overall management of the village. Q. What other services are available at the village? A. Most villages have a hairdressing service, a visiting podiatrist, physiotherapist, beauty therapist, and dry-cleaning service available at your own cost. Q. Who is responsible for insurance and rates? A. The village owner pays for the building insurance, as well as the general rates and water rates. You are responsible for insuring your contents and personal eﬀects. Q. Is there a way to voice my concerns, if any arise? A. Yes, you’re always welcome to raise any concerns directly with any staﬀ member, including the village manager. Alternatively, Ryman villages have a formal complaints procedure that can be explained to you, as well as a resident advocate. There are also regular resident meetings to discuss any concerns. Q. What happens if I move into the village but decide it’s not for me? A. We’re happy to say that in over 30 years this has rarely happened. However, if you change your mind after moving in, we will honour our 90-day money-back guarantee. This booklet is printed on an environmentally responsible paper produced from FSCÂŽ CertiďŹ ed Mixed Source pulp from Responsible Sources. It is Elemental Chlorine Free (ECF), and manufactured under the strict ISO14001 Environmental management System.